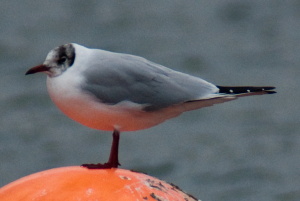 Gulls with black heads aren't black headed gulls! Two gulls seen in Watford today by B & Q had distinctly black heads which made me think of Mediterranean Gulls however my brief research indicates they lose their black heads during the winter as do Black-headed gulls which lose their dark-brown head colouring. Another possibility is Little Gull however these appeared larger. As these two particular birds were perched on a very high lampost I was not able to determine any other identifying features. I would appreciate comment regarding dark headed gulls in winter.